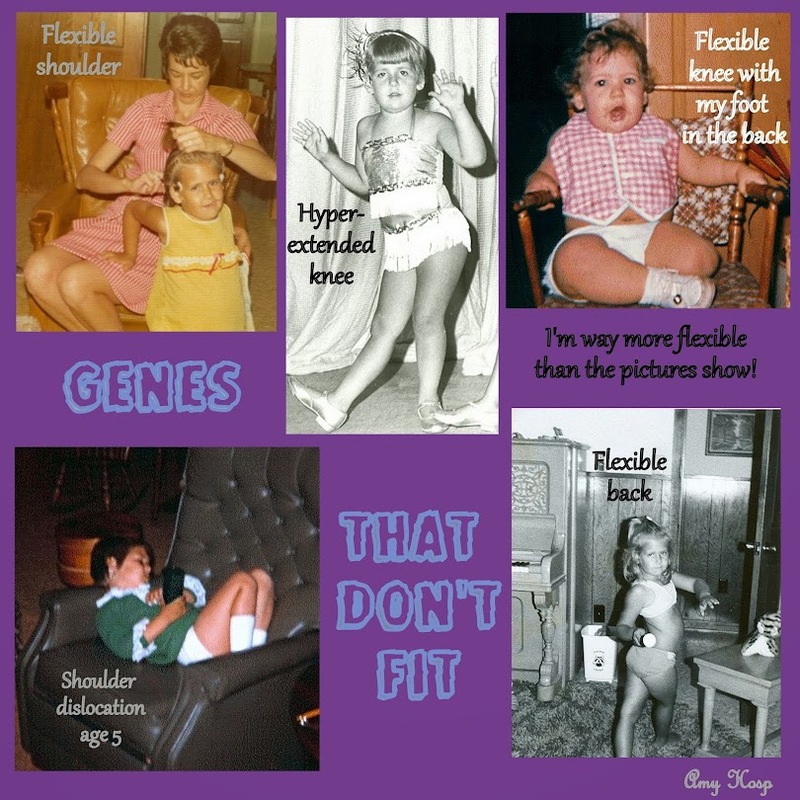 Having a genetic disorder is like living in a pair of jeans that don't fit. I am adopted and my genes never really did fit in but once I learned that I had Elhers-Danlos Syndrome Classical type I, not only did I know for sure that my genes didn't fit, I found out what has been behind any aliments that I have had my whole life. The pictures above clearly show that I am hyper mobile which is a hallmark of Ehlers-Danlos Syndrome. Ehlers Danlos and Mast Cell Activation Disorder are Connected With Depression. Having a disorder that causes chronic pain can leave the patient feeling very depressed. There are plenty of reason why an adult would feel depressed because of this, but for a child, there are just as many reasons to be depressed because of chronic pain. As I child I was always overweight and slower because my body didn't work like everyone else. I was depressed throughout my childhood because of that and knowing that I didn't measure up with my peers in many different ways. Ehlers Danlos can cause so many problems in a body, after all, we are 80% collagen so that means that collagen is everywhere from head to toe, including in our brains. Depression can be caused by EDS just as having to deal with life with EDS can cause depression. I want to use this post to educate about how Ehlers Danlos and Mast Cell Activation Disorder are connected with depression. I believe in counseling and I think it is important to help one grow in maturity with emotions. I wouldn't talk anymore about my own depression here but I do want to express that I believe in counseling for more than just dealing with chronic pain and what living with EDS is like. Depression happens to people for all kinds of reasons and all kinds of things happen to people that are hoped no one will ever find out about and some of those happenings are very damaging to people, more so to kids when they are going through it. I encourage you to help the children in your life whom you think may need to find someone to talk to about whatever may be bothering them, and for you, I encourage you to seek someone to talk to if you have things that just keep tripping you up or something that you always get mad about but you don't know why. I think you get the point that I'm trying to make here about seeking help to learn to grow through any pain or trouble that you are dealing with or and also may not be dealing with so well. Just click on the link to watch the video and then take some time to look through all of the information Dr. Diana has on her website! After watching this and talking to Dr. Diana about how this information fits me so well, it really has helped me learn what to do when these feelings jump up and grab me. I take an antihistamine for about two weeks and it helps me get these thoughts under control. Of course, I talk with my counselor to help me deal with the ups and downs of having a chronic illness just to make sure that I keep on track with what is good for me in the long run. I know you will learn lots by watching the video. This is another very helpful video where Dr. Diana discusses depression and suicide ideation due to issues related to EDS. Did You Know That Your Fingernails Are Speaking To You? If You Have Ehlers Danlos Syndrome You Will Totally Get It, If You Don't Have EDS Check Out This Article To See If You Can Find An Answer To Your Chronic Illness Here. Best article on Mast Cell and GI problems!!! What If No One Had Ever Heard Of Cancer And Would You Treat Me With Concern If I Were Pushing Around An IV Pole? This is my journey and I want you to come along with me and find in you, what I have and am still finding in me, "The person that God created me to be!" Part of my calling includes writing, photography, singing and being a missionary. My passion is to challenge the minds of fellow believers to look deep inside of themselves to find the true gifting's of God in their lives. Hallelujah - There is Victory In The End! Make the decision today to accept Christ and if you already know Jesus as your personal Savior than please tell those around you about Him. Written by Amy Hosp, Pictures by Amy Hosp unless otherwise sited. Simple theme. Theme images by Lingbeek. Powered by Blogger.